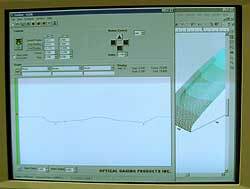 As part of National Manufacturing Week, the Design Engineering Show was held during March 5th through 8th, 2001 at McCormick Place in Chicago and is intended primarily for manufacturing and engineering professionals. 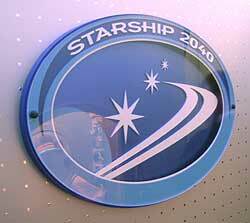 Welcome to DES 2001 -- Sit back as I describe some unique current products, along with technology that will be used in the manufacturing of products in the future. 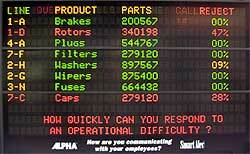 These cards contact complete computer systems that will plug into your existing IBM PC and are used primarily in factory automation. 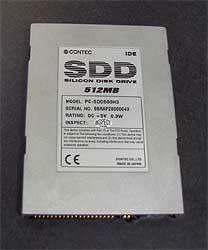 If you need another serial or parallel port for your laptop computer, these cards will help. While most computer system manufacturers protect modern processors (CPUs) with cooling fans, sometimes other components are not cooled to provide cost savings. 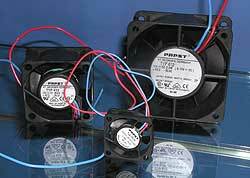 One specific use for these miniature Pabst fans is for cooling the voltage regulators used on some Pentium systems. This six foot wide display can be seen for several hundred feet. 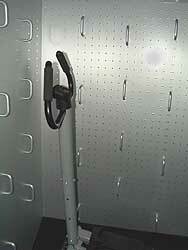 Smaller versions can be used for show the status of production line from a central location on the factory floor. In case you want one just like this tricolored model (displays red, green and yellow characters), it will cost about $25,000. It wouldn't be a technical trade show if Microsoft wasn't in attendance. 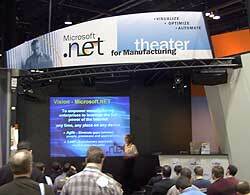 Here they are demonstrating Microsoft.net which can be used by manufacturers. This cool looking device is a testing and reference platform for CE 3.0 development. While not a consumer product (although it looks quite stunning), it is used to prove out a design for future Internet Appliances. 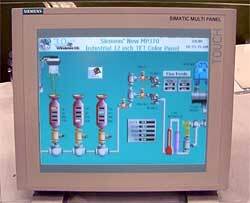 This Simatic TP370 display contains a real computer inside. 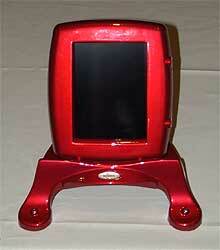 It features a touch screen is less than 3 inches thick. Imagine one of these for your master home controller. This ultraminiature switch (in contrast to miniature or subminiature), may appear in a PDA, cell phone or MP3 player in the future. It features both an up and a down action along with a center "push" control. 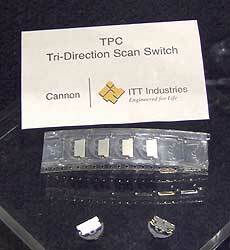 One use of this switch would be for basic up-down navigation through a contact list on a PDA or cell phone. The center "push" action would allow for selection of item selected with the up/down control ("dial" for the cell phone or "open" for a PDA). While this sounds basic, it allows simple one-handed operation of a mobile device with a thumb, instead of being a two handed operation. Now, one hand must hold the PDA or cell phone, while the other hand presses the screen or uses for the stylus. 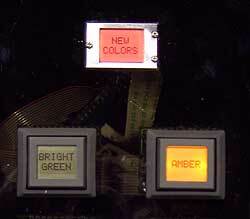 These unique switches can display words that can be electronically changed. 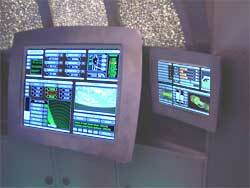 They contain miniature monochrome LCD screens (just like PDAs or laptops) near their top surface. 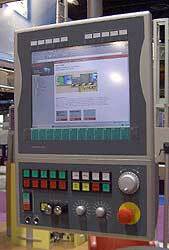 Applications are unlimited, but one novel use is to have bilingual buttons on factory control systems. With the press of a control button, all the controls of factory machine can now quickly change to the native language of the worker. This should help avoid industrial accidents and save lives. An odd product to show on Reviews OnLine, but the technology behind it is fascinating. During a recent NASA mission (with John Glenn aboard), a rose was flown into space. The microgravity caused the scent of the rose to change radically and become transformed into a scent not found on Earth. This altered scent was then chemically analyzed and synthesized on Earth to become Zen perfume.Read more about the NASA booth at the Design Engineering Show. 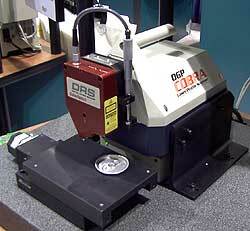 Using a laser beam this product can precisely measure the surface of small objects without touching the surface. This is the "readout" from the optical gauge. It is the variations on the surface of a pop can. The two small valleys are caused by the "printing" on the surface of the can. Go look at a pop can and see the "scratched" lettering. This gauge can precisely measure the depth of that lettering. 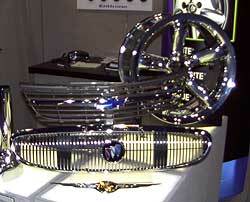 Examples of plastic automobile parts that have a shiny metallic finish due to Enthone coatings. 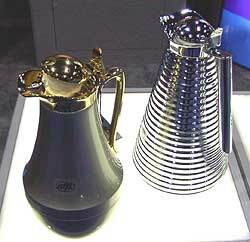 Consumer products (coffee pots) with the shiny Enthone metallic finish. 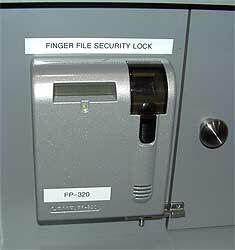 While James Bond may use a retinal scanner, this unique product uses fingerprint verification to open and close a lock. The entire system is self contained. Some automotive logos and badges that have a clear glossy protective finish from Douglas Corporation. This cabinet with attached PC is capable of printing in 3D. Yes, it can create physical objects (in plastic) directly from a computer model. 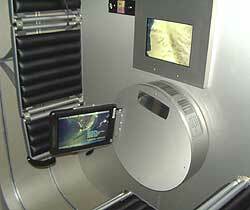 It uses a process called stereo lithography. Smaller versions of this printer could someday become consumer products as people grow tired of simply printing in color and want to make things. This model is $200,000. Another printer that uses a different technology to create 3D objects. This unit is about $25,000. 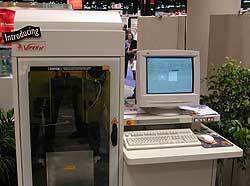 If you need to make a LOT of CDs, this Prostar device from Rimage is what you need. 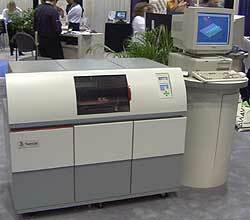 It contains EIGHT CD-R drives and two printers capable of printing directly (and uniquely) on each CD. The CDRs are 12x and the printers are capable of printing at 600x300 DPI in full color on the CD surface. It is quite fascinating to watch the robotic hand and arm perform the entire process. (pick up a CD, place it in the burner, write a CD, transfer it to the printer and finally eject a unique, individual CD). All within minutes. 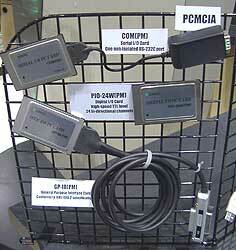 This system is powered by a Dell Poweredge 2450 server running a Pentium 3 667 processor. 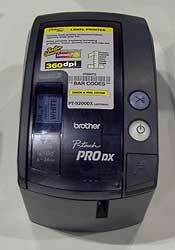 For more conventional printing needs, this printer labeler from Brother is capable of printing high quality (360 DPI) laminated plastic labels in minutes. 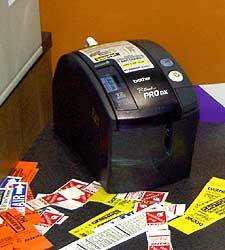 Based on the P-Touch technology used for years in consumer models, the Pro DX can print labels from your PC or Mac. Print sizes range from 1/4 inch to 1.1 inches high. This novel product is a printing white board. 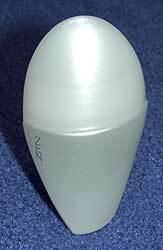 Read more about this unique product. 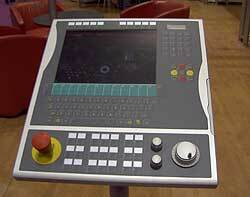 Some really cool control panels used in modern factories for automation and process control. 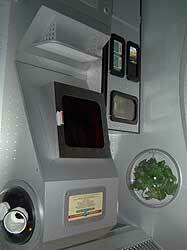 NASA had a walk through exhibit that tried to simulate what a commercial space flight (like a commercial airline of today) might be like in 2040. The equivalent of the "in-flight" phone of today. Remember the phone call in 2001? Looks like we are a few years behind. I noticed this Coca-Cola vending machine that had a full size image of Dale Earnhardt on its face -- we will miss you Dale!